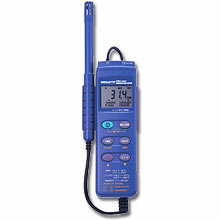 The HH314 is a low cost, high performance handheld meter with datalogging ability. It offers a triple display to show the temperature and humidity from a handheld probe and can display data from a separate K type thermocouple connected via a standard SMP type miniature connector to the T2 input. The temperature/ humidity probe uses a semiconductor and polymer capacitive sensor. A software package and interface cable is included to allow real time or recorded data to be read by a PC through the RS232 port.